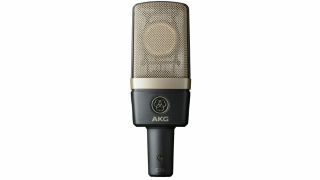 MUSIKMESSE 2015: AKG has unveiled a new condenser mic, the C314, which has four selectable polar patterns, plus an overload LED indicator. The mic is based around the same capsule as the C414 XLS and also comes with a 20 dB attenuation pad and a bass-cut filter. Meet the C314 professional multi-pattern condenser microphone, the latest sibling from one of the industry's most widely used studio and stage microphone families. Designed for enthusiasts and professionals alike, the C314 has advanced features that help artists fine-tune their signature sound including four selectable polar patterns, the lowest self-noise in its class, and an overload detection LED. Using the same one-inch dual diaphragm capsule as the C414 XLS, musicians, engineers and producers can have the confidence that their audience will experience every subtle nuance as it was intended.